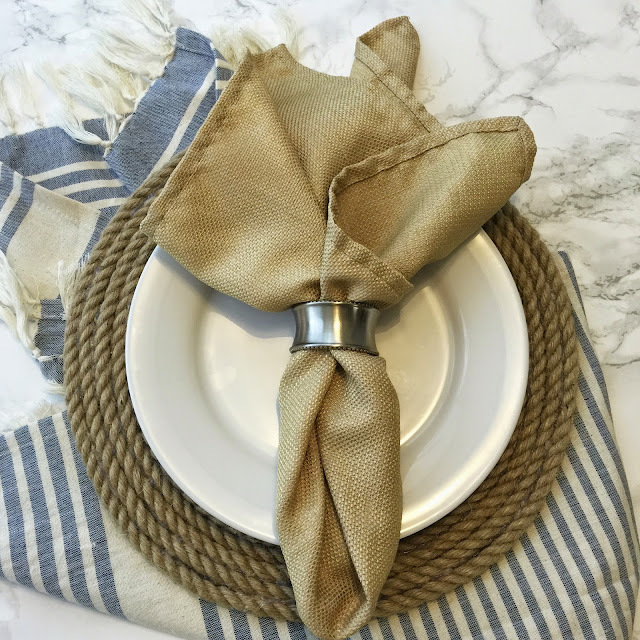 I'm not going to lie, I'm a little bit obsessed with table settings... linens, napkin rings, chargers - I love it all! The only problem? The prices add up quickly! Chargers from Pottery Barn, for example, are easily $15/each, and after you buy a set you're pushing $100 pretty quickly. I had some left over jute from my DIY vase, and I decided to put it to good use and make a DIY plate charger! I only had enough jute to make a single charger, but I fully intended to complete the set this weekend (...while starting a new TV series - any suggestions?!). 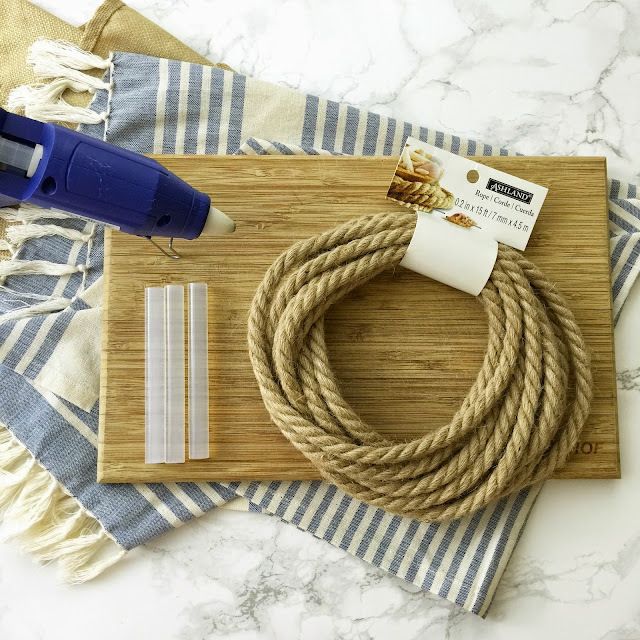 Ultimately, the amount of jute you need will depend on the thickness of your rope, but 20 feet/charger is a pretty good starting point for a standard dinner plate charger. Side note, you can buy 50 feet of jute for $5-8 (depending on the thickness) from Home Depot (that's only $3-4/charger). This is notably cheaper than JoAnn and Michaels... so save yourself some money and skip the craft store - Home Depot for the win! 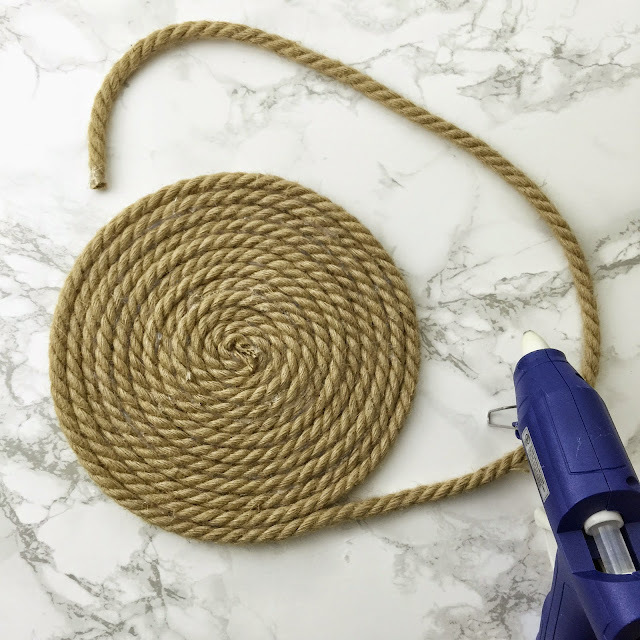 The process is quite simple (which are always the best DIYs!). 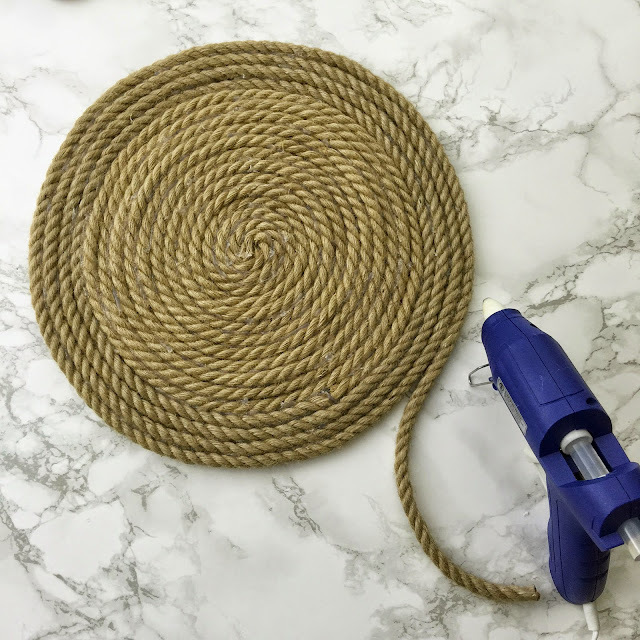 Using the hot glue gun, begin to form a circle (which will be the center of the charger), and glue the jute around as you continue to build and wrap outwardly. Continue this process until you near the end of the jute. 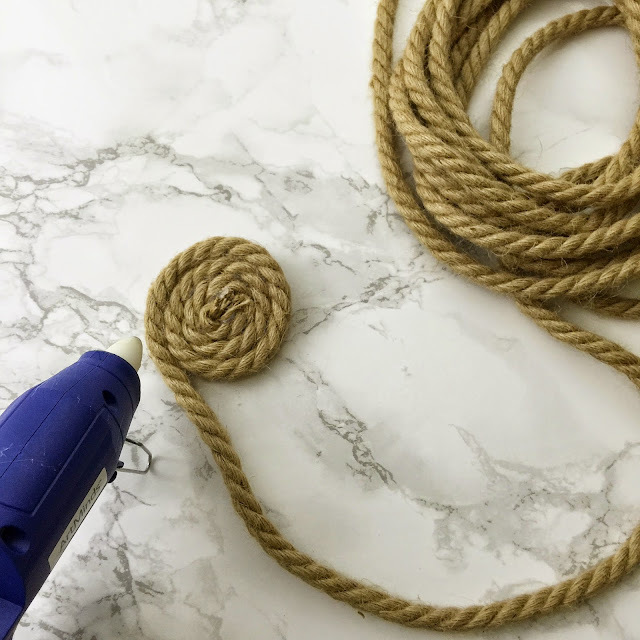 Insider tip: It is helpful if you hold the jute for a few seconds after gluing to help let the glue cool. Before fastening the end of the jute to the charger, use a little bit of glue on the end so that it won't fray. After securing the end and done gluing, press the charger flat and pull off any globs of glue that are super obvious. Keep in mind that plates will be on these, so imperfections won't be noticeable! At only $4 a piece, you don't have to worry about a set of 12 breaking the bank. 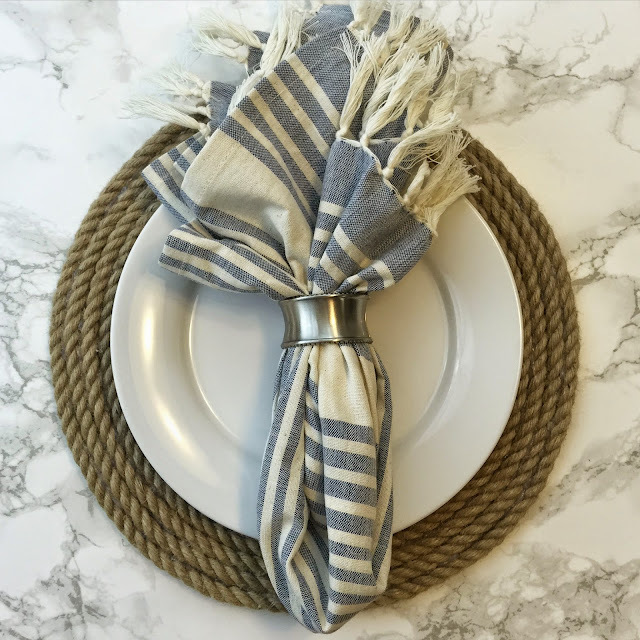 I absolutely love how it turned out - rustic and simple... pair with a soft linen napkin, and you've got a perfect combination! Those are so cute, they totally look like you bought them at a store!! Have a great weekend!! So pretty - you are the DIY queen! Your stuff always comes out so perfect! I literally love EVERY DIY you have ever done (including this one). Can you please just come decorate my house?! So cute!! These are too perfect! Love them! LOVE this!! I'm definitely going to have to make them, especially for summer get togethers! Ummmmm totally have jute. Totally doing this!! Thanks for an amazing idea, girl! I love how this turned out, and I especially appreciate the Home Depot tip - what an adorable and cost-effective DIY!! I love these -- what a fab idea! this is stunning.!! Good job..! VERY cute and so simple! Thanks for the DIY Lisa! adorable! and so much better than $15 a piece!